Offering exclusive (private) ocean experiences including sailing, snorkeling, whale watching, dinner cruises, business lunches/meetings, spa cruises, overnight excursions, weddings, ash scatterings, private parties, fireworks cruises....Whether you are looking for relief from the chaos of everyday life, to celebrate a special occasion, or be inspired for your next chapter in life...the ocean has the answer! We specialize in private charters to meet your every need. 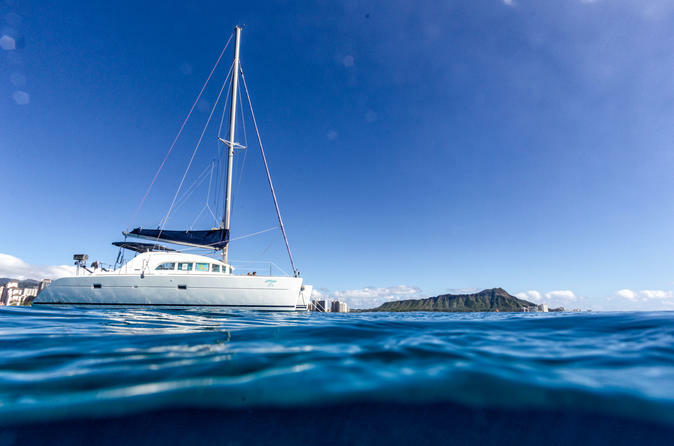 The Boat: There is no better way to experience the environment of the ocean in Hawaii than aboard our comfortable and intimate catamaran Lotus. Catamarans are legendary for their stabile ride and spacious deck and cockpit areas, and the hammock at the bow offers a truly memorable experience riding suspended above the waves. Our Cat was built in France by a highly esteemed luxury boat manufacturer and is one of the few French catamarans legally permitted for Captained charter in Hawaii. Please see our photo gallery for her features including an open cockpit to main salon layout with a pass-though bar window, a spacious main salon with panorama windows, and large comfortable cabins lined with exotic wood veneer.The Lagoon 380 catamaran by Beneteau is the worlds most popular sailing catamaran. The Activity Whale watching" Our whale watching cruises will allow you to experience the habitat of majestic marine mammals such as dolphins and whales. These cruises are done under sail and with engines secured which emphasizes the natural marine environment, minimizes the impact on marine life and enhances your experience. A professional photographer and marine mammal enthusiast will be available during the cruise. DLNR regulations shall be strictly observed. Sight Seeing Cruise"Indulge in the natural beauty of Hawaii and enjoy sightseeing to your heart’s desire when you choose this cruise. You command the destination with options like Diamond Head, Turtle Canyon Waikiki, Keehi Lagoon Park, Koko Head, and Hawaii Kai.